Way back in the ‘60s, there were just 22 universities in the UK plus a lot of technology colleges, basic and advanced, offering vocational courses designed to turn out tradesmen, craftsmen, and others who were more adept at manual skills than cerebral skills. Then along came the Robbins Report in 1963 with the recommendation that some of the higher Colleges of Advanced Technology (CATs) be upgraded to become full universities and that university places “should be available to all who were qualified for them by ability and attainment”. Thus began the drive to expand the number of universities in the UK from the original 22 to 45 by the mid-‘70s to 130 as of August 2017. Yes, 130, many of which are now struggling to attract enough customers (undergraduates are now referred to as customers) with most of the funding coming from student grants (70% from UK, EU and non-EU fees, only 18% from government sources) and at least three universities are alleged to be on the brink of bankruptcy. Be that as it may. My purpose in writing this blog is not to criticise the current UK university scene, although I may do this in a future blog. 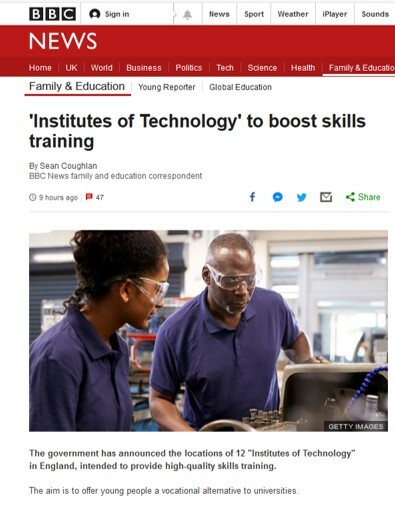 No, it’s to comment on today’s announcement of the location of twelve new Institutes of Technology designed to “boost (engineering) skills training”. We’ve come full circle! Folland Gnat 2-seater fighter and trainer aircraft. Back in the early 1960s, I got caught up in the effects of the Robbins Report. I was an engineering apprentice working for what was then Folland Aircraft (now part of British Aerospace via Hawker Siddeley Aviation) and working my way up a skilled craftsman and drawing office route with local City & Guilds (C&G) and Ordinary National Certificate (ONC) courses at Southampton Technical College. My career path was either to become a skilled worker on the aircraft manufacturing production line, or aim higher towards either the drawing office or the tool room. I’ve misplaced the fancy ONC certificate! 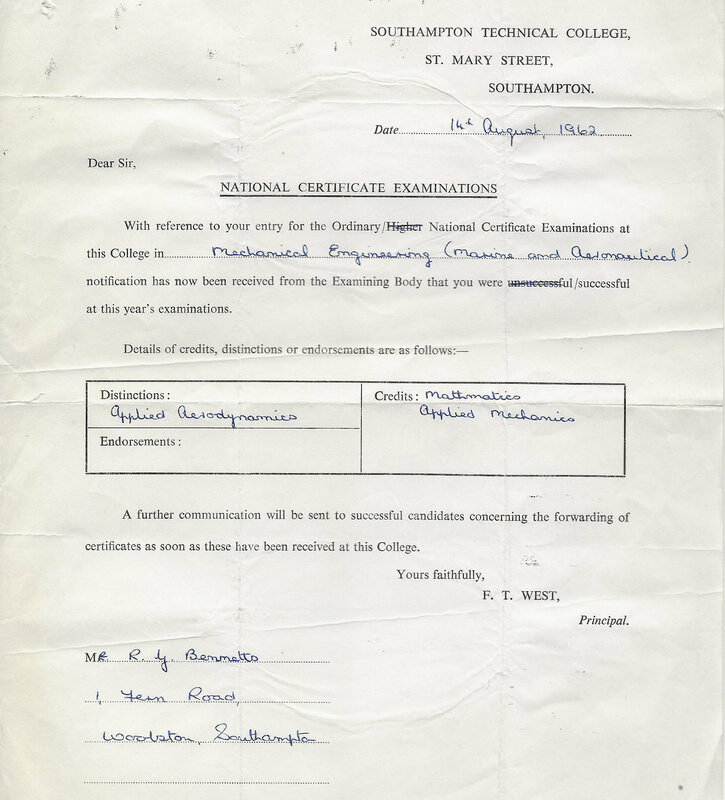 By 1962, two years into my apprenticeship, my C&G/ONC examination marks were high enough to qualify me to enter a 4-year Diploma of Technology (Dip Tech) course at Farnborough Technical College. 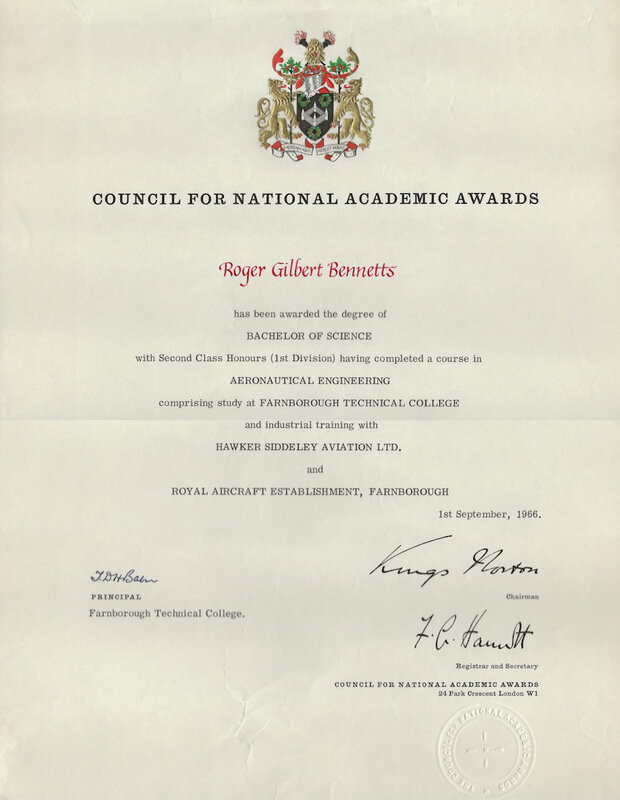 At the time, the plan was to graduate in 1966 with a Dip Tech in Aeronautical Engineering awarded by a degree-awarding organisation known as the Council for National Academic Awards, CNAA, in London. I graduated, but not with a Dip Tech. Robbins changed all that. I graduated with a BSc in Aeronautical Engineering. At the time, there was much discussion about the implications of the Robbins Report. In my own case, I argued that the Dip Tech was not the same as a traditional university BSc in engineering. The Dip Tech course I followed was a 4-year course with, every year, six months in college and six months spent in industry – in my case, sometimes back at Folland Aircraft, Hamble, but mostly in the Royal Aircraft Establishment, RAE, in Farnborough now, alas, no more. 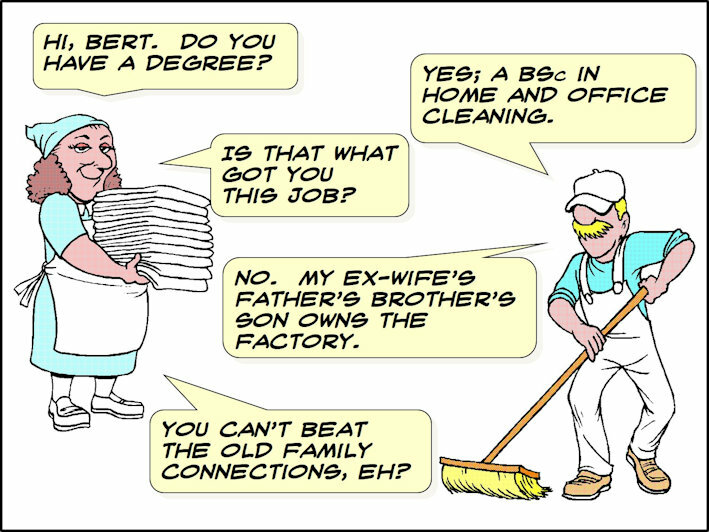 Half my four years obtaining the degree was working in industry refining my practical skills. That doesn’t happen with a full time 3-year BSc degree course at, say, Bristol University, and I was unsure of what the new BSc paper award meant in terms of my ability to compete with those who had graduated with what I then considered to be a bona fide degree in aeronautical engineering. In the event, I never practised as an aeronautical engineer – I went into electronics – but that’s another story. At the time, there was also much discussion about what would happen to the training of skilled technical people if technical colleges were being replaced with universities? We asked who would build the engineering systems if everyone became a designer or a manager? How would industry cope with a plethora of Chiefs but no Indians? Would our membership of the EU allow us to poach skilled workers from other EU countries? Those questions, and more like them, raged fiercely during the further rapid expansion of UK universities throughout the ‘90s when all the UK polytechnics, often referred to as technical universities, were upgraded to university status and, nowadays, we have serious concerns about the current UK university scene and what happens to those who graduate with what are sometimes called ‘Mickey Mouse’ degrees. The existence of the elitist Russell Group of, currently, 24 so-called top UK universities has created a class structure within UK universities. The scandal of ‘unconditional conditional offers’ has meant that anyone, no matter how badly they perform at A-level, is guaranteed a place on a degree course somewhere irrespective of their final entrance examination grades. There’s no university entrance pass/fail filter anymore. It’s ‘bums on seats’ that matters. The university as a ‘business with customers’ has seen Vice Chancellor salaries of over £400,000 per year (equivalent to the annual tuition fees of approximately forty students). In comparison, Theresa May, the UK’s Prime Minister, earns £150,000 per year although she does have the use of a fancy apartment in Downing Street. And, UK graduates who take advantage of a government loan to cover tuition fees and maintenance can finish up with a debt of up to £60,000 with only 17% of current students forecast to pay back their loan fully. I assume that, at some point, the government of the day will have to write off this debt much to the anger and frustration of the taxpayer. The higher education system in the UK is a mess. There’s an argument that says many of our engineering firms and national institutions like the NHS would not have survived without the influx of skilled workers from outside the UK, both EU and non-EU, but that argument is countered by the fact that we have singularly failed to produce our own skilled workers since the massive growth in the number of UK universities since the 1980s. I think the new Institutes of Technology will definitely help to redress the balance and I look forward to the day when they are renamed polytechnics and colleges of advanced technology. I’ve been pondering this one. I have often prattled on about the ‘mickey mouse’ degrees and the lack of focused vocational training. I could have converted my Occupational Therapy Diploma into a degree but decided not to. That’s not to say I haven’t got some very useful certificates. I did lots of post qualification training and could lead you up a river blindfolded, build a raft to rescue you, track across Bodmin Moor in the dark to find ‘treasure’, complete a health and safety assessment, assess you as a student, assess your NVQ potential and even lead an empowered organisation and most importantly manage change. That’s just a few of the many team building and professional growth tripe I completed over my career. All of which of which was vital to survive in the never ending change of the NHS. As for reinventing the wheel I really do think the NHS is way, way out in front.